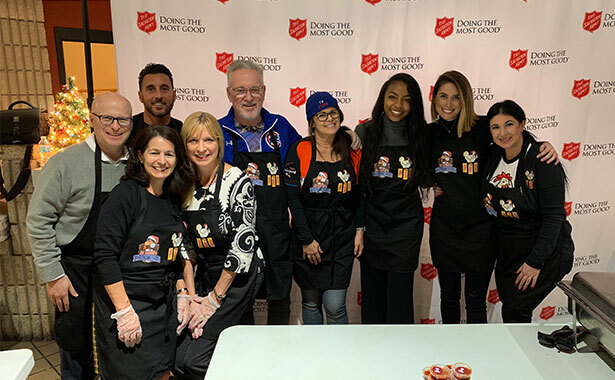 This week we joined our friend, former Tampa Bay Rays and current Chicago Cubs Manager Joe Maddon and his Respect 90 Foundation, to provide meals to the homeless during his 10th annual Thanksmas giveback. While Maddon and his wife Jaye spent time putting a smile on each guests face and ensuring everyone received their special gift from the Foundation, PDQ had the pleasure of serving our famous Crispy Chicken Tenders, Chile-Lime Corn, Beans and Rice, Fruit Harvest Salad, Fresh-Baked Cookies, and Homemade Sauces at both St. Vincent de Paul CARES in St. Petersburg and The Salvation Army of Tampa/Hillsborough County in Tampa to more than 300 people. “We are proud to partner with Joe and his Respect 90 Foundation to make a difference in the Tampa Bay area this holiday season,” said Nick Reader, PDQ CEO and Co-Founder. “Joe continues to do amazing things not only in our community, but all over the country, and our team is honored to give back and help in any way that we can." We are so humbled to partner with such a great community leader in Joe Maddon, and look forward to teaming up again!